Fenugreek is an herb that the Memorial Sloan-Kettering Cancer Center indicates is also called bird's foot, trigonella, Greek hayseed, Methi, bockshornsame and hu lu ba. Its scientific name, however, is Trigonella foenum-graecum. Fenugreek yields pods that contain 10 to 20 seeds each; it is the seeds that herbalists use to create fenugreek tea. The taste and smell of fenugreek tea is comparable to maple syrup. Possible applications of fenugreek include treatment for cancer, arthritis, diabetes, inflammation, infections, wounds, ulcers, cramps and lymphadenitis. Gastrointestinal side effects of fenugreek tea are common, including flatulence, diarrhea, stomach ache, insatiable hunger and indigestion. They are not severe, may diminish over time and occur almost exclusively due to regular use of fenugreek tea in significant amounts -- at least 100 g daily. 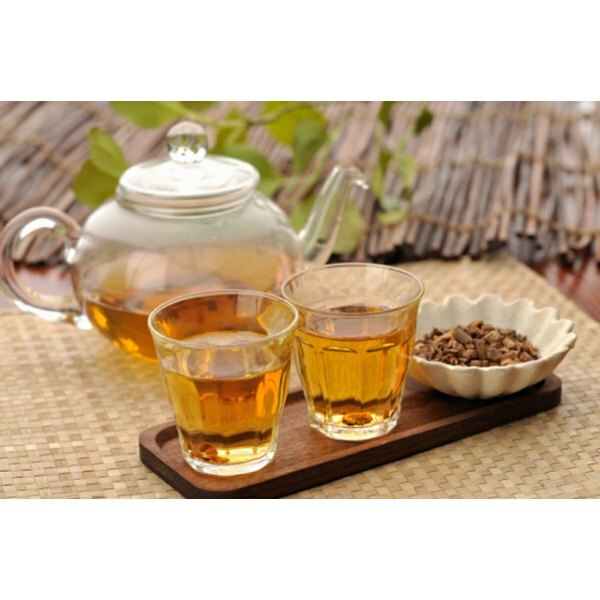 Fenugreek tea is a diuretic, according to "The Complete Guide to Herbal Medicines." It may also alter the scent of urine to become similar to maple syrup. Moreover, it lowers blood serum glucose levels, which can result in hypoglycemia, or dangerously low blood sugar. Effects due to hypoglycemia include dizziness, hunger, sweating and irregular heartbeat. If you suspect hypoglycemia, contact your doctor immediately. Fenugreek is contraindicated by a variety of medications, including antidiabetic agents, insulin and anticoagulants, because it lowers blood glucose levels. Fenugreek tea may cause bruising or bleeding in rare cases. Headaches have also been reported, according to the Memorial Sloan-Kettering Cancer Center. If any of these side effects occur, discontinue and contact a medical professional.